Anyone who follows the business side of Nintendo’s operations will no doubt be familiar with the concept of the ‘Blue Ocean’ strategy adopted during the Wii’s lifetime; ‘Blue Ocean’ centring around utilising an untapped market when marketing a product, as opposed to directly facing competitors head-on. The Wii was obviously met with success, regardless of how it shaped up against its competitors, but when thinking about Nintendo’s strategies it’s important to remember that the Wii was certainly not the first time the Big N made use of a blue ocean. In fact, it would be as early as 1992 that Nintendo would first greet players with deep blue waters ready to be conquered; not be through the introduction of a groundbreaking product, however, but through a series a hot-blooded personal watercraft races spanning a variety of aquatic courses. The blue ocean of Wave Race is hardly comparable to the business strategy, but perhaps in some ways it’s just as important to Nintendo. The major discrepancy held between Wave Race and other well-known Nintendo racers is that it is arguably less unique a concept. Mario Kart offers multiplayer madness across brightly coloured, fantastical courses, the roster ranging from a tie-wearing ape to a sentient mushroom man. F-Zero, on the other hand, oozes with high-octane, stylised action in a far future where highly dangerous death races are essentially a household name. In comparison to the big-shots of Nintendo’s racing scene, Wave Race is seemingly more grounded. Real-life vehicles (even as far as featuring watercraft produced by real-world companies in later entries) driven in themed (yet still feasible) water courses, accompanied with racing physics which are notably modelled on those seen in real-life water ski racing. It’s a curio to see such a grounded game from the Nintendo a company who are known for taking us to brave new worlds, often relying on fantastical elements to let us escape from real life. But it’s the way Nintendo’s unique charm works with that realistic base that makes Wave Race such an appealing franchise. 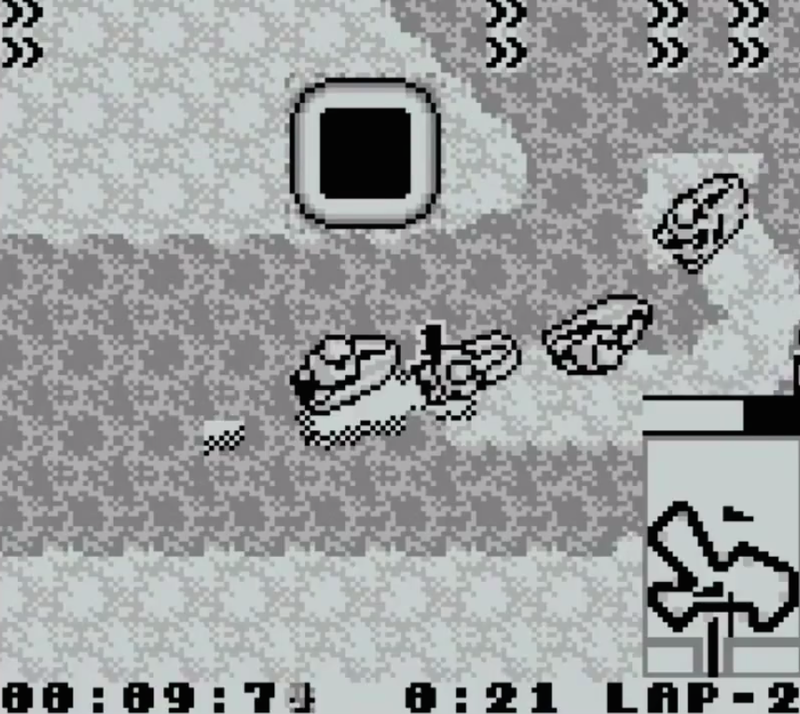 The first Wave Race title, aptly titled ‘Wave Race’, appeared on the Game Boy in 1992, and in some ways contrasts in itself with the fellow titles in its series. 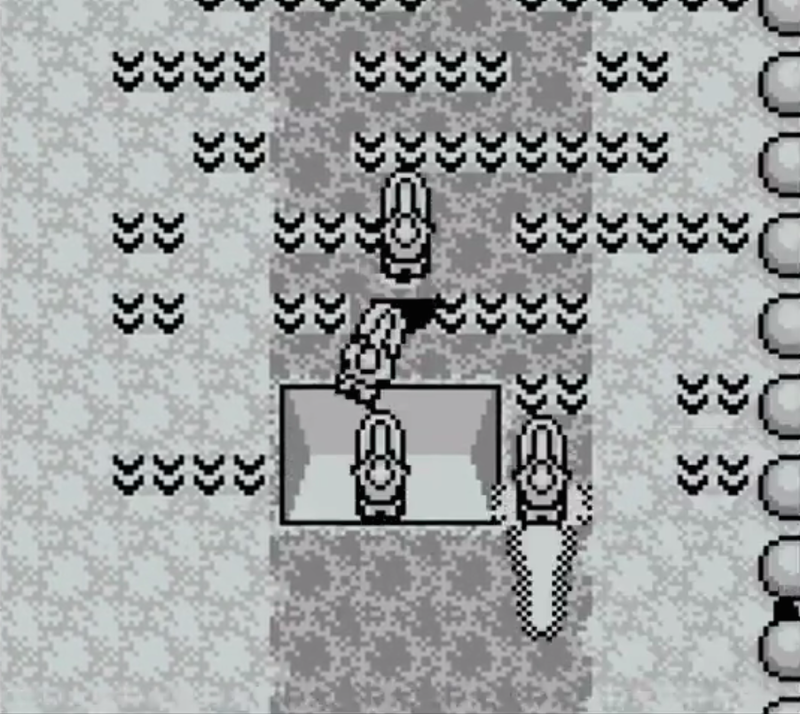 Offering a simple top-down style of gameplay and visuals vaguely reminiscent of the worlds of the earliest Pokémon titles, if said worlds were made up entirely of ocean tiles. It’s undeniable that this portable Wave Race is clearly not the pinnacle of the series (or of Game Boy games, for that matter), but the early take on four-player racing multiplayer filled with sharp turns and power-ups a plenty is commendable, considering the game predates Super Mario Kart by mere months. The game’s courses are tough, and whilst my personal experience with the title has largely involved a difficult uphill struggle to grasp victory, it appears to be a racer that certainly would require practice to execute masterfully. Going up against computer opponents in a selection of modes and difficulties makes this a fun little title that could perhaps benefit from a release on the 3DS Virtual Console, considering it’s an ideal retro portable time-killer. Surprisingly, despite definitely being the least-popular title in the series (presumably with some not even realising that the Wave Race series started life on the Game Boy), the game sold well enough to merit a re-release under Nintendo’s ‘Player’s Choice’ banner; for a game shrouded in relative obscurity today, selling over a million copies is hardly an achievement to be scoffed at. Such commendable sales figures would potentially be enough to warrant a sequel on their own, but the extreme sports craze of the 90s would provide Nintendo with an even greater incentive to give the series a revival on the Nintendo 64. Released in 1996, Wave Race 64 is potentially the most well-known of the Wave Race series, and certainly the best selling entry; Wave Race 64 managed to shift a total of 2.94m units worldwide, more than double than that of fellow EAD-developed racer F-Zero X. One considerably unique aspect of this title in comparison to fellow Nintendo titles is the utilisation of real-world branding and sponsorship to create a truly believable world around the gameplay itself; machines and signage (as well as the game’s box and title screen) are branded with sponsor Kawasaki Heavy Industries’ logos, and in today’s light, frequent appearances from soft drink brand Fanta in-game are almost comedic. Regardless, it’s a surprisingly unobtrusive use of product placement that has clearly been handled with Nintendo-levels of sensitivity. The jump from 2D to 3D would certainly benefit the Wave Race series’ attempt to provide realistic aquatic sports action, and in comparison to the now rough-looking visuals of the Game Boy original, the 3D visuals would provide players with gorgeous tropical waters and sandy beaches that would not look out of place in the glamourised extreme sports videos and commercials of the era. Varying weather and time conditions across the track only work to create an even more compelling experience (albeit hardly by today’s standards), but amongst the realism, the colourful machines and racing suits, along with a fantastic and incredibly catchy soundtrack by Kazumi Totaka give the title a real ’Nintendo’ feel, giving it its own charm without taking away from its competence as a sports title. Some would argue that the gameplay and controls aren’t perfect, and it’s certainly undeniable that they take some getting used to before you can take 1st place in every single race, but this only furthers the game’s more realistic approach that still allows it to hold up as one of the finest titles of the genre. The third (and as of yet final) appearance of the Wave Race franchise would thrust the series into a more crucial role; as a launch title for the GameCube. Amidst a questionable selection of launch titles, notable for lacking a traditional Mario game (in contrast to every Nintendo console prior), a lot was resting on Wave Race: Blue Storm’s shoulders, even more so considering it was the first title in the series to be developed outside of Nintendo’s EAD. Instead handled by Nintendo Software Technology (NST), Nintendo’s US development division. Perhaps this decision was made closely in-line with the series’ theme, as compared to many of Nintendo’s other traditional offerings, Wave Race dealt with a concept that was largely popular in the West, and thus would capture the majority of its market in this region. A western-developed arguably benefitted Blue Storm by bringing in a number of elements that felt quite in-line with the audience and themes of the Wave Race series, introducing a more rock-orientated soundtrack that fits more closely with the stereotype of extreme sports, character artwork in a comic book-like style, and the adoption of a number of characters from Nintendo’s other N64 extreme sports offering 1080° Snowboarding, a franchise that NST would also be tasked with producing a GameCube sequel for later in the system’s life. 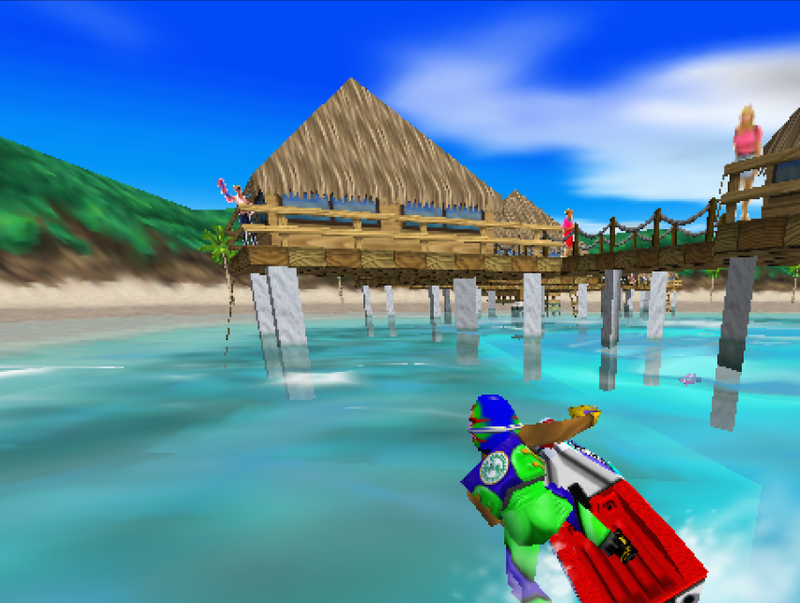 The title would, however, inherit the impressive visual effects of its Japanese-developed predecessor, utilising the GameCube’s power to provide even more praise-worthy water and weather effects, along with an even more realistic take on water ski physics that were unmatched by any other title at the time. The new title’s weather effects were especially hailed by critics, as a feature that was now taken beyond mere visual enhancement, instead having an intuitive effect on the game’s physics and course layout, often adding an element of unpredictability to races that certainly provides a more compelling and challenging multiplayer experience. However, at launch it was claimed that perhaps Blue Storm had taken a few too many leaves out of Wave Race 64’s book; for some, copies and re-designs of courses from the N64 entry made Blue Storm feel uninspired and perhaps too familiar to those who had played and enjoyed the series across both consoles. 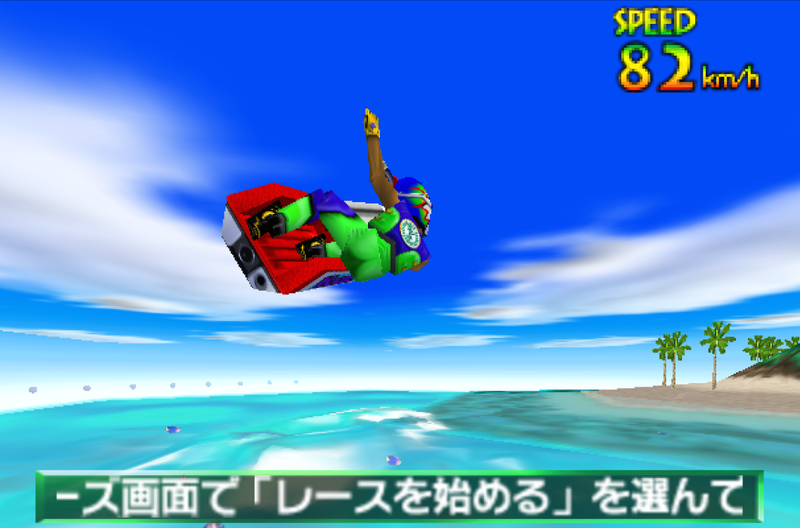 Understandable criticism about the game’s controls, which in comparison to the smoother and easier-to-operate controls of Wave Race 64, required intense precision in using the GameCube’s control stick and triggers, creating a level of what could be potentially be considered artificial difficulty. The game’s sales were certainly nothing noteworthy, but the quality and care taken by NST in handling a beloved and respected franchise cannot be judged on these figures alone; notable touches ranging from the unique and exciting designs and re-designs of characters old and new, to the minor inclusion of a top secret announcer who berates you throughout the race in a hilarious fashion (an easter-egg not discovered until 9 years after the game’s release) show that this is clearly a title imbued with NST’s passion to give a new lease of life to a classic Nintendo sports IP. 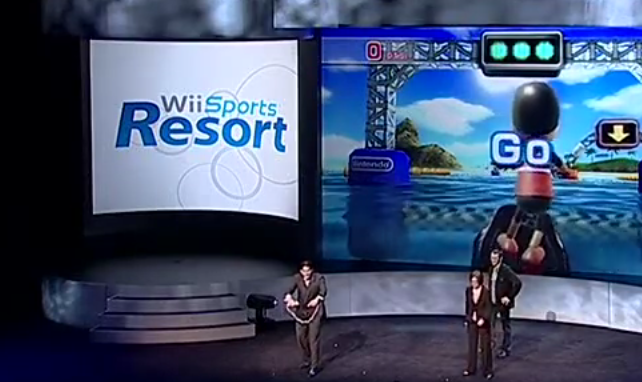 I suppose it could be argued that the closest we’ve gotten to a new Wave Race title in more recent times was the ‘Power Cruising’ game included in the Wii MotionPlus debut title Wii Sports Resort, memorably demonstrated by Reggie Fils-Aimé onstage at the quite frankly abysmal E3 2008. 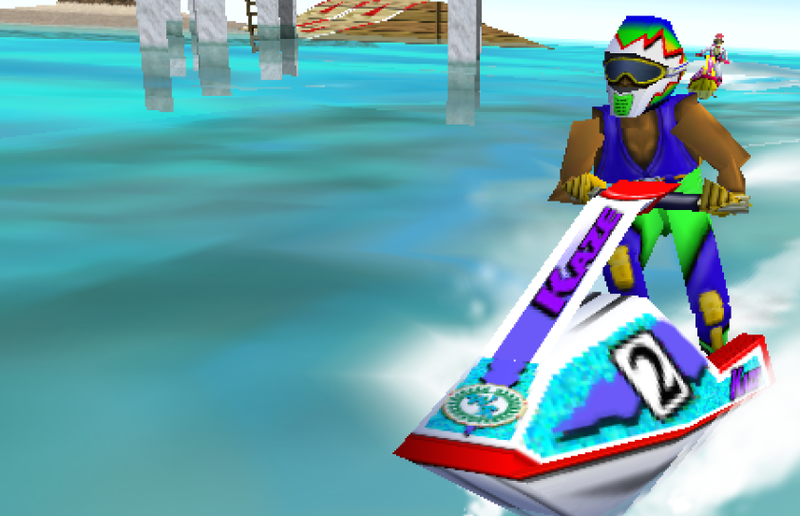 Whilst clearly lacking in the character, charm and atmosphere of the Wave Race series, perhaps this shows that Nintendo still have the potential to produce a solid take on the personal water craft sports genre. I wouldn’t hold your breath for a new title any time soon, but perhaps one day we could find ourselves taking to the crystal clear waters of Dolphin Park once again. This entry was posted in Features, Retrospective and tagged EAD, Features, Game Boy, GameCube, Nintendo, Nintendo 64, Racing Games, Retro Games, Retrospective, Sports Games, Wave Race. Bookmark the permalink.